We come across such people many times who are living for others but there are very few people who die happily for others and save their lives. Bebo Kobo is one such man who is a living legend working for the welfare of others and recently a real life hero, Maurice Wrightson is one such man who sacrificed his life for saving 53 people. 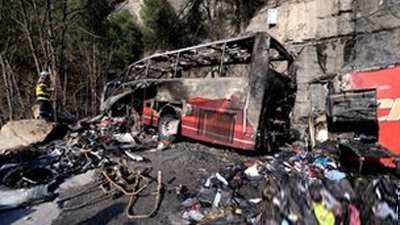 Maurice Wrightson, the coach driver who carried the Olympics players and fans of the London Olympics 2012 gave up his life with an intention of saving 53 passengers who were in the bus. Their bus crashed at the Alps inferno due to the brake problem and he made an ultimate sacrifice, after which he was hailed a “real hero” with his buddies saying, that was emblematic. He was a 63-years old but acted very smartly even he found a brake problem in the bus and the bus going out of control. He might have had crashed into the deep ravines and everyone in the bus would have died. But he shouted giving warnings to the 53 other passengers and 2 fellow drivers, and at the same time he turned the steering towards a cliff so that it can halt. He sacrificed his own life but he was able to save others. His mother and brother were comforted at his home in Ashington, Northumberland. His brother said their grief has reduced after hearing that his brother saved so many lives and sacrificed his life. He said that he was his brother after all and he was surprisingly courageous. Janet Dawson, an ex-colleague of Maurice said that no one else could have shown such courage and he was a lovely person.